Staying in beautiful accommodation always gets us in the right mood for a holiday and when that accommodation blends seamlessly with its environment it really adds to the full vacation experience. 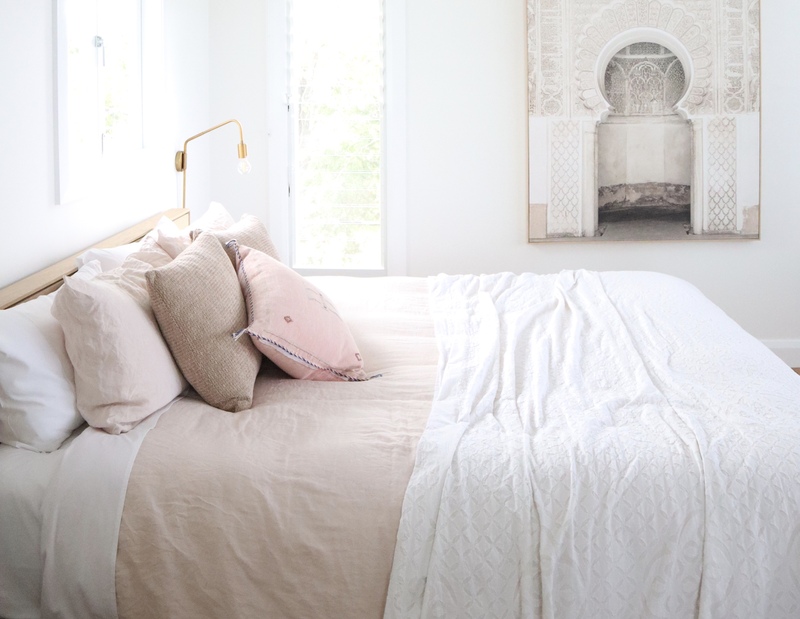 The Manor by Byron Beach Abodes does exactly that – luxe coastal chic interiors that are both calming and luxurious, high quality fittings and thoughtful touches make it one of our favourite recent holiday home experiences. The Manor is a four bedroom home, situated on a quiet residential street within walking distance of the main shopping area of Byron Bay. An upstairs master retreat features a walk in robe, private ensuite and study and is a perfect parents escape. Downstairs there are three additional bedrooms, two with sitting rooms and en suites, which makes it suitable for multiple couples holidaying together. There is a great outdoor entertaining area with an outdoor kitchen and plunge pool, perfect to enjoy the beautiful northern New South Wales weather. All of the rooms feature high quality, earthy toned linens and soft furnishings. The beds are big and comfortable and rooms have fans to combat the summer heat. It is the little touches that make this such a great holiday home, Hunter Lab toiletries, complimentary wine on arrival and beautiful coffee table and cook books that will inspire you to make the most of the impeccably designed kitchen. Wandering through the shops in Byron Bay and surrounding towns it’s easy to see where some of the beautiful pieces on display in The Manor have been sourced from, if you are inspired to pick up a few homewares to take home try Mar-kett in Byron Bay for Moroccan cactus silk cushions and homewares and Newrybar Merchants for gorgeous rugs and linen. The Manor is just one of the holiday homes managed by Byron Beach Abodes, to see more of their properties and details on how to book visit their Instagram here and website here. Want more beautiful accommodation? Click here for one of our favourite luxury Dubai hotels and here for a luxurious Perth hotel stay.